My husband and I are big movie fans. We can often be found on weekends at the theater or camped out in front of the TV with a pile of Netflix movies. There’s just something almost magical about the way movies can whisk you away to another place and time, all without leaving your seat. The Oscars are on tomorrow – the ultimate celebration of achievement in cinema – and we’re pretty excited. I was thinking I would need something to munch on during the 3+ hour show, and what’s more appropriate for a movie-themed event than popcorn? At the same time I remembered I had some caramels in the pantry that needed to be used. Caramel popcorn seemed the obvious choice, but because it’s still Chocolate Month and everything is better with chocolate, I added some chocolate too. The result? Dark Chocolate Caramel Popcorn. Oh yeah. It’s the perfect movie (or awards show) snack. A little salty, a little sweet, and satisfyingly crunchy. I can’t wait to shovel it all into my face tomorrow night… if it lasts that long! There are 10 Best Picture nominees this year and I’ve managed to squeeze in seeing 6 of those 10 movies. My 4 favorites were True Grit, The King’s Speech, Inception and Toy Story 3. If I had to bet on a winner, my money would be on The King’s Speech. Who do you think is going to win? If you’ve never made stove-top popcorn, don’t worry – I hadn’t either before this! It’s really easy. If you’d like step by step photos, check out How to Make Perfect Homemade Popcorn on Brown Eyed Baker. Line 2 baking sheets with Silpats or wax paper. Combine oil, popping corn and salt in a heavy bottomed, large pot over medium-high heat. Place a lid on top, just slightly askew to vent steam. Remove from heat when popping has almost stopped. Transfer popcorn to a large (5 quart) bowl. Remove any unpopped kernels. In a small saucepan, melt caramels with half & half, butter, and a pinch of salt over low heat, stirring frequently. Drizzle melted caramel over popcorn and toss until evenly coated. Divide popcorn evenly between the prepared baking sheets. Combine chocolate chips and butter in a glass, microwave proof bowl. Microwave on HIGH for 30 seconds. Stir, then continue to microwave for 10 seconds intervals, stirring frequently, until chocolate is melted. 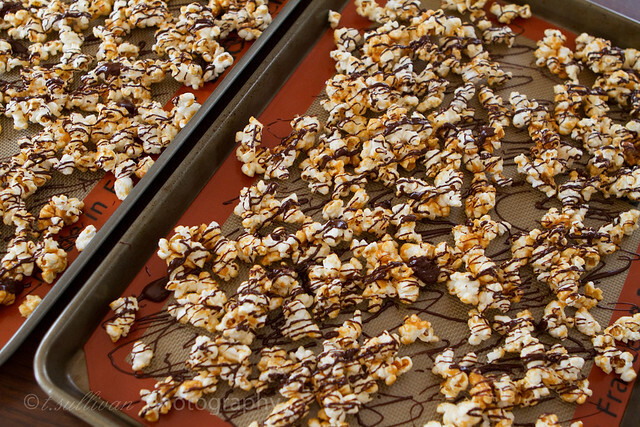 Drizzle chocolate over popcorn. Let sit at room temperature for an hour or more to harden. Best eaten the day it’s made, but can be stored in an airtight container at room temperature. Hmmm… I really liked True Grit, Inception and The Social Network. I just hope Black Swan doesn’t win. I still get the heebie jeebies when I think of that movie. We finally watched The Social Network last night. Let’s just say it wasn’t my favorite. I was relieved when it ended! I would be happy if True Grit or Inception won though. James and I just watched “True Grit” in theatres here on our date while my mom was still here. It was such a good movie! I didn’t expect it to be so funny. Inception was really awesome too. 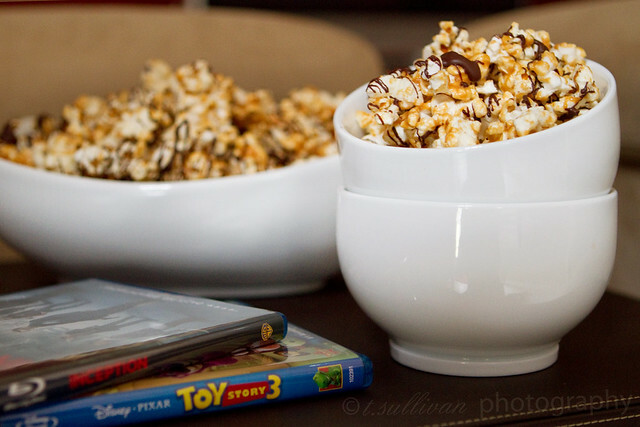 Your Dark Chocolate Caramel Popcorn looks like the perfect snack for movie night! Cheri, we really loved True Grit too! I wasn’t expecting it to be so funny either. Of the nominees I’ve seen, it was easily my favorite. I think the judges will prefer The King’s Speech though. We’ll see tonight! I LOVE stovetop popcorn. After making it for the first time a few years ago, I’ve never been able to go back to the microwave stuff. I’ve made caramel corn a lot, but never thought to add chocolate. I will definitely try that next time! Love, love stove top popped corn!! Absolutely can’t wait to try this!! Popcorn is my favorite guilty pleasure. I just saw the Kings Speech last night and it was amazing, now I know why it won! Yum! I got an air popper for Christmas, so this is definitely going to have to happen in my house. Be still my popcorn-loving heart! What good is a movie without popcorn. Love the recipe. Thanks. Wow this looks so delicious, it reminds me of my childhood days. Popcorn’s good to go! I so would love to have some. I tried it. I LOVED it. Yum!